I was at the opening of the Accessible Art Fair last night. I didn’t have big expectations. Somehow I linked “accessible” to “easy to understand, simple”. Not that there is something wrong with easiness. But in my view art should not aim at easiness nor at complexity. Then even the sheer fact that it was taking place in a posh hotel (Steigenberger Grand Hotel) on its own right was making me skeptic. Already there I understood the concept by experiencing it. The artists were there at the spot, presenting their works. They approached everyone who stopped to see their art and were open to answer questions. They talked, when asked, about the concept behind their work or the lack of such, about their background and creative process. It was great. I talked with quite a few of them, which helped me to have a glimpse into their individual universes. But then more than the artists said their art. And the fair offers a huge variety of styles and techniques of painting, drawing and photography. Many of the works kept my attention and appealed to me to stay longer in contemplation. The fair will continue till 19:00 h tomorrow. I strongly recommend it. Thus this post, written fast. Later I might share more impressions and add some pictures. But now…I am in a hurry to go back there. I would advise you to do the same. The 5-euro ticket is valid for the three days of the fair. Cool, isn’t it? I went back to the fair on Sunday afternoon. My stay there was very short this time. Already on Friday, I was impressed by the work of Olivier Robin, a French artist who lives in Brussels. I liked his vast canvases with small figures of people in them as if they presented our lives seen from a larger perspective, from somewhere up there…I didn’t notice this smaller painting then. Yellow. With a couple in its left corner, taking a picture of themselves. Immediately, I linked it to my new book, the one, I am now starting to write. It takes place on Fuertaventura. I asked the painter whether this was a desert. “This is not a place”, he said, “This is a condition. Emotion expressed in colour”. 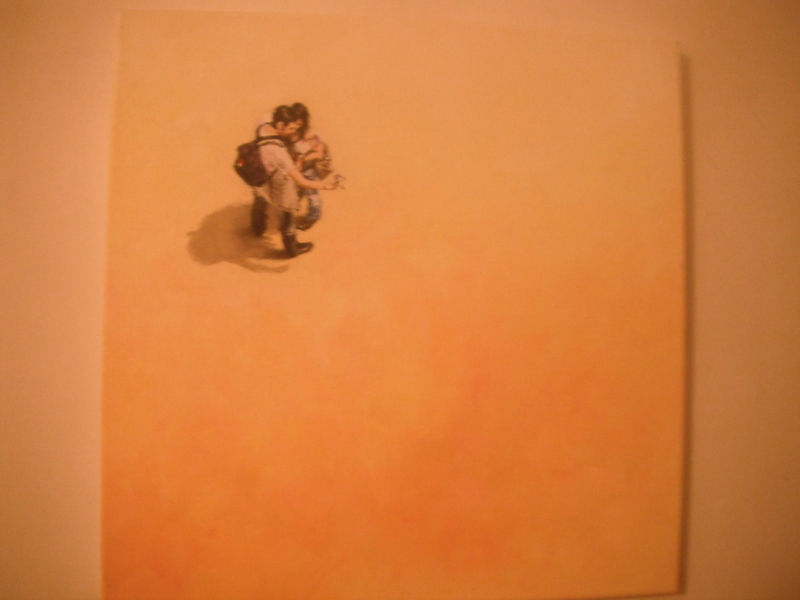 The painting was the first one of a vertical series of four works. The figures in them were creating diagonal in their movement, each of them situated ahead in space, compared to the previous one, but also in time, aging… Still to me, it perfectly worked independently as well. Soon after I left, holding it. A piece of sun, adventure and dreamfulness for the winter. A visual inspiration for my novel. My week started in an unexpected way and I was wondering how it would end. It begun with music. It ended with a painting. 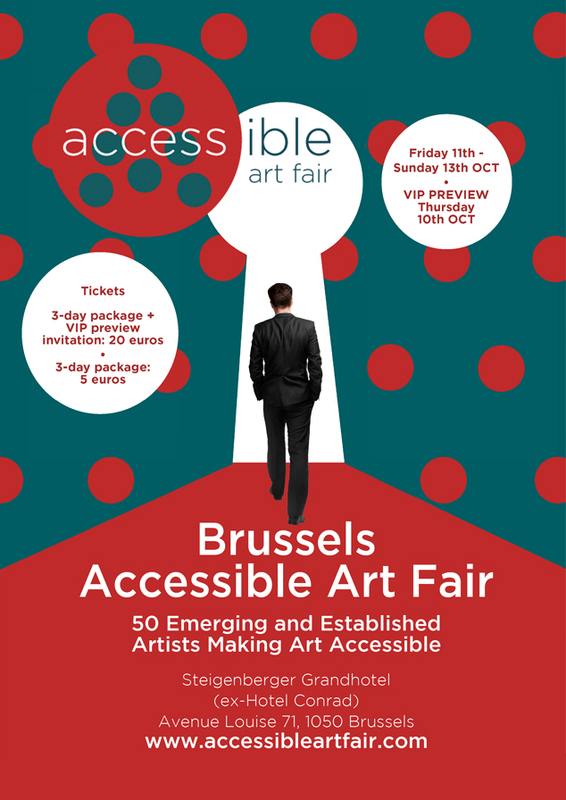 Tags: Accessible Art Fair, art, Olivier Robin, Steigenberger Grandhotel, Visual Art. Bookmark the permalink.